PHILADELPHIA—July 1, 2010. 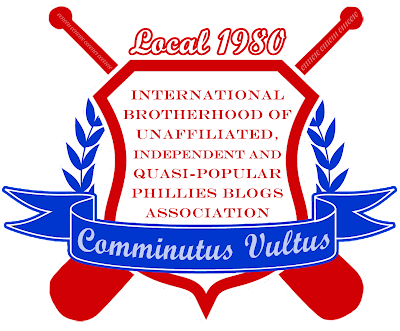 The Fightins (www.thefightins.com) and I Want to Go to the Zoo with Roy Halladay ("Zoo With Roy", www.zoowithroy.com) today announced they are chartering The International Brotherhood of Unaffiliated, Independent, and Quasi-Popular Phillies Blogs Association (IBUIQPPBA). The IBUIQPPBA will serve as the industry leader for face-breaking blogs that maintain and display the spirit and freedom afforded by working without the shackles of corporate/organizational oversight or the tangential relationships that go along with being beholden to the man. As founding members, The Fightins and Zoo With Roy enter into, and create, an organic, brand synergistic, cross-functional platform that is win-win, sustainable, green, and ultimately user-focused, in an effort to bring the greatest experience possible to people on the Internet that read blogs and also like the Phillies. Both executive teams feel the IBUIQPPBA will serve the greater Phillies blogosphere community in a way that has never been seen before. "Yo cuz, this is going to rule," said The Fightins founder M. Michael Meech at a recent Greater Philadelphia Chamber of Commerce luncheon. The Fightins and Zoo With Roy also sell fashion-forward, industry leading t-shirts. 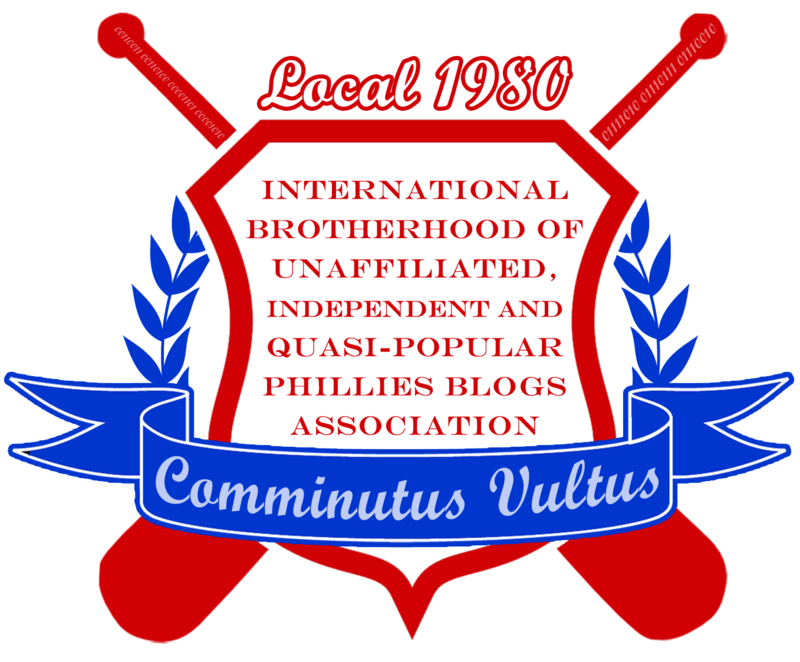 The Fightins is the best Phillies website on the Internet and in April 2010 won a fan vote-driven tournament of Phillies blogs called “The Phield” by defeating other blogs such as Beerleaguer.com, the 700 Level, Phillies Nation, and that one where the guy does the thing with the hacky jokes about players. Personally hailed by Phillies hitting instructor Milt Thompson as his favorite bolg about wanting to go to the zoo with Roy Halladay, zoowithroy.com has set bustas off their marks and brought levity to everything it has touched, feigned touching, or even happened upon randomly since approximately the winter solstice of 2010 (an exact date is scientifically impossible). In addition to being featured on ESPN’s First Take (no seriously, but it aired on ESPNews that day), ZWR has been mentioned in, featured by, fawned over, dreamed of, and referred to ad nauseam by basically every legit media source out there you or your sister can think of (yeah, them too). ZWR was also once clinically proven to be better than eating stromboli in a hot tub with that Uruguayan girl from Deadspin.com. Zoo With Roy is also the first Phillies bolg in history to scale Zermatt in a backpack containing only frosted strawberry Pop Tarts. Oh great. I spent all this time inventing my new "Individual Baserunner Ultimate Intelligence Quotient Pythagorean Partial Batting Average" metric, and now I have to come up with new name!! Without That Ball's Outta Here, IBUIQPPBA is nuthin'. How do I get in on this and represent Doug Glanville to his fullest? sell various of fashionable products, high quality and not expensive, it can meet all yourfashion demands. a good online shop. please come here and you will share the best price and service.